Afrika is, at the moment, teetering on the brink of becoming the world's next economic powerhouse. The Forbes billionaire list for 2018 includes a total of 18 Afrikan citizens, predominantly from South Africa, Egypt and Nigeria, while a third of countries in the continent are experiencing an annual rise of more than 6% in GDP. These figures mean that Afrika is second only to Asia in being generally touted as the newest up-and-coming global superpower when it comes to the speed of economic growth. Business leaders on the continent credit this meteoric rise to a combination of two things: vast untapped markets attracting foreign investors and an almost unprecedented, rapid technological uptake. The continent is the second largest mobile phone market in the world and startups are now springing up in almost every major city, particularly as bandwidth costs continue to fall. For some, the rise of technology innovation is a cause for concern, especially in the wake of new findings about privacy and increasing public awareness about sharing of personal data on the Internet. Ugandan authorities just this month declared a tax on social media users, starting July 2018, whereas startling new regulations in Tanzania mean that bloggers will be charged a license fee of approximately $900 each. However, qualitative research indicates that such restrictions are flying in the face of progress. According to Betway Casino's feature on those who made the leap from millionaire to billionaire, investment in technology is the fastest way to gain billionaire status worldwide. Afrikan citizens and several governments have been quick to take notice of the potential of tech and the latest manifestation of the trend towards tech-based investments and startups is now beginning to blossom throughout the continent. Tech hubs are spaces where Afrikan entrepreneurs can gather to brainstorm ideas in an open-access and often WiFi-enabled workspace, with the guidance of, in some scenarios, mentors, university professors and business leaders. Popular also in many parts of South Asia, they are sprouting up at a startling pace in Afrika. 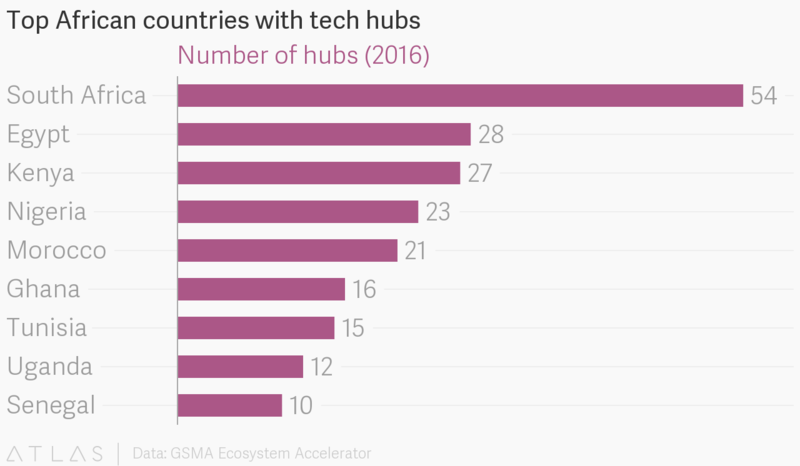 The year 2015 saw less than 120 such hubs in Afrika according to the World Bank but the most recent figures gathered by GSMA Ecosystem Accelerator suggested there are now 442 active tech hubs. Many of these hubs are grant-funded by governments or foundations and focus predominantly on providing a co-working space for the community. However, the more visible hubs, such as iHub in Nairobi and the Zambian BongoHive in Lusaka, are beginning to shift towards becoming self-funded, profit-making ventures aimed at start-up acceleration. It's clearly working. More than 150 start-ups have been launched out of iHub alone since it was founded in 2010. Though it still retains its function as a community and co-working space, iHub now receives 70% of its funding from its operations, such as consulting, events and corporate partnerships, rather than grants. Two years ago iHub announced its strategy to become 100% self-financed. The importance of these hubs for technological progress is hard to overstate. While government support does a lot to bolster this in local communities, it would impossible for digital entrepreneurship to flourish on this alone. Furthermore, hubs are unique in offering a slightly more community-focused and less profit-oriented service than corporate players, making them an important bridge between private and public support for tech. Many have described them as the "pillars" of the Afrikan tech community, propping up gaps in infrastructure and IT training that otherwise hold back budding entrepreneurs. Their importance has been recognized by numerous global leaders in tech, such as Zuckerberg, Sundar Pichai of Google and Alibaba's Jack Ma, who have all visited hubs in the past two years to launch products or look for new opportunities. While the utopian vision of tech hubs can be hard to resist, it is important to note that there is a significant disparity across the continent when it comes to the speed with which opportunities are being created and embraced. As the diagram from GSMA below shows, just five countries (South Africa, Kenya, Nigeria, Morocco and Egypt) house 50% of Africa's tech hubs, although almost all countries do have at least one or two hubs of their own. Some of this disparity can be credited to differences in ICT policies, with governments more willing to enable and encourage development likely to reap significant rewards. More importantly, however, these spaces cannot thrive without an already-existing eco-system of money, tech companies, universities and other such raw materials of progress, meaning that the gap between major players in the tech and business scene like Nairobi and less connected, secondary cities in Afrika widens ever further. At the moment, the clear frontrunner in this race is Lagos, the Afrikan city with the highest number of tech hubs at 31 and, with Facebook looking to open its own hub there, it's unlikely that the city's stranglehold on the Afrikan tech scene will let up any time soon. However, outside of the top 5, there are still some other countries displaying significant growth. The Ghanian ecosystem, home to the notable MEST hub, has grown by 50% since 2016, while Abidjan in Cote d'Ivoire looks to become the forefront of innovation in Francophone Africa. Uganda, despite somewhat prohibitive policy decisions, looks to be leading the way in East Africa, while Zimbabwe is creeping to the head of the pack in the South. Tunisia and Senegal are also threatening to become major players, both with more than 10 hubs each. More importantly, however, the over-saturation of primary cities means that some of the smaller cities in Afrika's most technologically advanced countries are now beginning to see their day in the sun. The "Silicon Savannah" of Nairobi has become so developed that new hubs are beginning to open outside the city, while other lesser cities like Johannesburg, Kumasi and Alexandria are also set to have their moment. While it is impossible to know just where lightning will strike next on the continent when it comes to progress, it is almost certain that Afrika's technological advance shows no signs of abating yet.